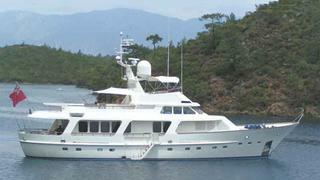 Jeroen Van der Vliet at Van der Vliet Quality Yachts tells me he acted for the buyer and seller on the sale of the 25.7m motor yacht* Moon'n Star*, the 26th Moonen yacht sold by his company. Built by the Dutch yard in 1989 to a design by Diana Yacht Design, she had a full refit in 2001 and was brought up to Germanischer Lloyds class. The third hull in a series of only six built, this pocket superyacht accommodates six guests and three crew. Twin 409hp MTU engines power Moon'n Star to a cruising speed of 10.5 knots and a range of 3,000 nautical miles. An interesting point is that this is the 205th sale recorded so far this year, the same number sold in all 12 months of 2010. Looks like we're heading for a bumper year in 2011. Moon'n Star was asking €2.95 million.